KNOXVILLE, Tenn. (AP) — Tennessee quarterback Jarrett Guarantano’s ability to avoid mistakes has his team on the verge of a bowl berth. Guarantano heads into Saturday’s game with Missouri (6-4, 2-4 SEC) having thrown 146 straight passes since his last interception. He broke Casey Clausen’s 15-year-old school record for consecutive passes without an interception last week during a 24-7 upset of No. 20 Kentucky, which was ranked 12th at the time. Tennessee (5-5, 2-4) is one win away from bowl eligibility, a much greater concern for Guarantano. The sophomore quarterback says he wasn’t even aware of his school record until he was asked about it. “What record was it?” Guarantano said after the Kentucky game. Guarantano has taken plenty of hits since arriving at Tennessee as a highly touted recruit from Bergen Catholic High School in Oradell, New Jersey. Yet he keeps coming back up. “I think he’s the toughest quarterback in the country,” Tennessee tight end Eli Wolf said. Rated as the nation’s No. 1 dual-threat quarterback in his class according to composite rankings of recruiting sites compiled by 247Sports, Guarantano redshirted his first year on campus and lost a preseason competition to Quinten Dormady last year. He replaced an ineffective Dormady as Tennessee’s starter midway through a miserable season in which the Vols went 4-8 and set a school record for losses. Guarantano remained the starter this year after withstanding a preseason challenge from Stanford graduate transfer Keller Chryst. Guarantano has come a long way since, though he still has much work to do. “Jarrett’s just got to continue to kind of stay within what we’re asking him to do, take what the other team gives him, don’t hold on to the football (too long), get it out of his hand,” Tennessee coach Jeremy Pruitt said. Guarantano ranks fourth in the SEC in completion percentage (.651) and passing efficiency (149.21). Guarantano is operating behind an offensive line that lost center Brandon Kennedy and preseason all-SEC tackle Trey Smith to injuries. He’s working with his third offensive coordinator in as many seasons. Odom has his own quality quarterback in Drew Lock, whose 11,342 career yards passing rank third on the Southeastern Conference’s all-time list. Lock is 187 yards away from overtaking former Georgia quarterback David Greene for second place. Lock has thrown for 2,647 yards this year, far above Guarantano’s total of 1,768. Guarantano isn’t as prolific as Lock, but he’s delivered his best performances in Tennessee’s biggest wins. He threw for a career-high 328 yards in a 30-24 victory at Auburn and was 12 of 20 for 197 yards with two touchdowns against Kentucky. “I think he has a lot more confidence than what he used to,” Tennessee receiver Marquez Callaway said. Guarantano isn’t shy about showing that confidence. Guarantano’s reactions over the course of the game amused his teammates. 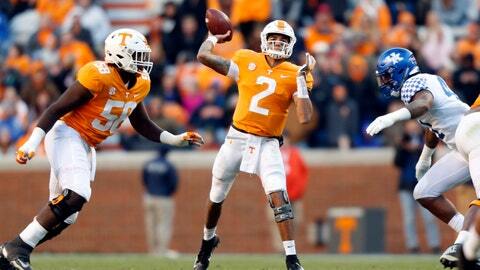 Guarantano believes teammates feed off the energy that arises when he shows his emotions.